What Does Code P0116 Mean? The ECT (Engine coolant temperature) sensor is used to measure the engine temperature and is threaded in the engine coolant jacket and in direct contact with the engine coolant. 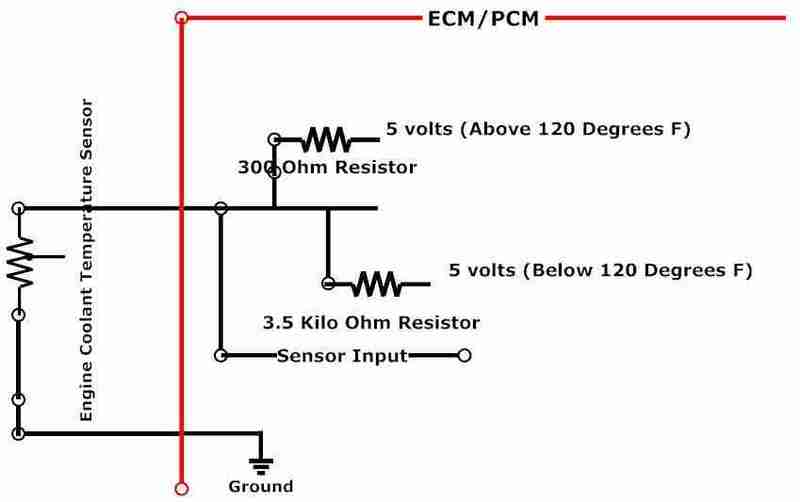 The ECT is a thermistor, (resistance is inversely proportional to temperature) the resistance of a thermistor decreases as the temperature increases. As the resistance decreases, the voltage input to the engine computer changes with the engine temperature, which provides engine coolant temperature information. Low coolant temperature has high resistance and high coolant temperature has low resistance (High Voltage/Low Temp [Cold Engine], Low Voltage/High Temp [Warm Engine]), which can be verified with a digital voltmeter. The ECT has a very high resistance when cold and low resistance when hot (see table). This type of thermistor is called an NTC (negative temperature coefficient), which is opposite to the situation with most other electrical components. So, if the coolant sensor has a poor connection (high resistance) at the wiring connector, the computer will see a higher voltage signal and would supply a richer-than-normal fuel mixture based on the resistance of the coolant sensor and set one of the ECT diagnostic trouble codes (DTC). 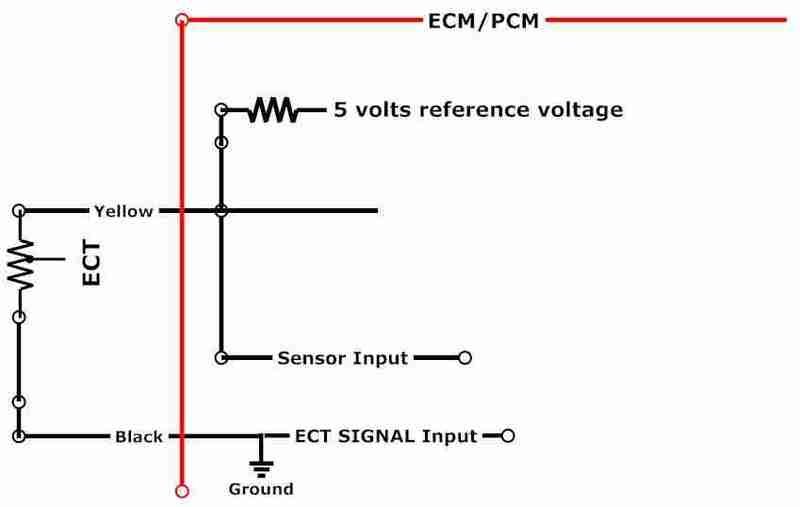 Some vehicle manufacturers use a step-up resistor to broaden the range of the ECT sensor (Figure 2). Figure 2 shows an example of a 2-step ECT circuit showing that when the coolant temperature is low, the computer applies a 5-volt reference signal to the ECT sensor through a higher resistor compared to when the temperature is higher. The DTC P0116 diagnostic code will set if the computer sees slow changes in voltage indicating a change in temperature from the ECT signal line or if there is a rapid change in voltage/temperature that does not match the Intake Air Temperature (IAT) sensor readings. Remember the ECT signal is high voltage/low temp [Cold Engine] or low voltage/high temp [warm engine]. If the engine has been off, as measured by the ignition off timer, for a long period of time, the engine computer (ECM/PCM: engine or powertrain control module) compares the engine coolant temperature soon after engine starts with the intake air temperature soon after engine start. If the startup coolant temperature minus the startup intake air temperature is greater than a calibrated value, then the diagnostic will indicate a fault and set DTC P0116 and puts on the malfunction indicator lamp or MIL. The MIL is also called the Check Engine Light and the Service Soon Engine light. What are the common causes of code P0116 ? Computer detects a temperature difference at power-up that indicates that the ECT sensor is 86° F (30° C) warmer than the IAT (Intake Air Temperature) sensor. Computer detects a temperature difference at power-up that indicates that the ECT sensor is 61° F (16° C) warmer than the IAT sensor, and NO engine block heater was detected. Computer detects a temperature difference at power-up that indicates that the ECT sensor is 61° F (16° C) warmer than the IAT sensor, the engine cranked for greater than 10 seconds without starting and no engine block heater was detected. What are the symptoms of code P0116 ? Poor fuel economy and a possible-rich DTC (diagnostic trouble code). Leaner-than normal fuel mixture would be supplied to the engine and can cause a possible-lean DTC (diagnostic trouble code). Surging or hesitation driveability caused by too-lean fuel mixture and can cause a possible-lean DTC (diagnostic trouble code). The computer is looking for a change in voltage. How do you troubleshoot code P0116 ? If not already done, go to an online service information provider like ALLDATA or Mitchell On-Demand or equivalent and download the P0116 diagnostic procedure and diagnostic circuit check. Also do a TSB (Technical Service Bulletin) search for issues related to DTC P0116. Turn the ignition ON and connect a scan tool or laptop computer with the appropriate interface and software using the instructions provided with the scan tool to the vehicle DLC (data link connector). If the scan tool does not work, check, use the diagnostic circuit check you downloaded in step 1. Compare the temperature of the engine coolant as displayed on your scan tool with the actual temperature of the engine and record the scan tool engine temperature. Maximum difference between the two readings should be 10°F (5°C). If actual engine temperature varies by more than 10°F (5°C) from the scan tool temperature, check the ECT sensor wiring and connector for damage or corrosion. To check that the wiring and see if the computer is working okay, with scan tool still connected, look at the ECT temperature and unplug the connector from the ECT sensor. The temperature on the scan tool should read about −40° F. With the connector still removed from the ECT, use a fused jumper lead and connect the 2 terminals of the connector together, the scan tool should display approximately 285°F (140°C). If the above test works, the connector and wiring are most likely okay, check the ECT sensor for resistance and compare to the actual engine temperature chart in Step 6 below. Check that radiator reservoir bottle is full and radiator itself is filled to top. recommend checking the ECT sensor after the cooling fan has cycled twice, indicating a fully warmed engine. ECT sensor must be submerged in coolant to be able to indicate the proper coolant temperature. Check for proper operation of the cooling fan. If the cooling fan does not operate correctly, the engine may overheat. Go to an online service information provider like ALLDATA or Mitchell On-Demand or equivalent and download the Temperature Versus Resistance – Engine Coolant Temperature Sensor table for ECT for the vehicle you are working on. With the Ignition OFF, disconnect the harness connector at Engine Coolant Temperature Sensor. Test the ECT sensor while running the engine to vary the sensor temperature while monitoring the sensor resistance with DMM ohmmeter function: Animation: Test Engine Coolant Temperature ECT Sensor (View) (Download). Compare the readings with the downloaded table. The resistance values should be in range of the table values. You can also check the resistance of the sensor with the DMM ohmmeter function as also shown in the animation. Check the downloaded service information for the right specification. If not within the specified range replace the ECT sensor. If within the specified range, test for infinite resistance between each terminal and the sensor housing. If less than infinite resistance, replace the ECT sensor. If infinite resistance is okay, check the computer. Go to an online service information provider like ALLDATA or Mitchell On-Demand or equivalent and download the wiring diagram for ECT for the vehicle you are working on. Study the wiring diagram and using a highlighter trace the circuit from the computer to the ECT sensor. With the ignition OFF and all vehicle systems OFF, disconnect the harness ECT connector. Test for < 5 ohms between the low reference terminal and ground. If 5 ohms or greater, turn the ignition OFF, disconnect the harness connector at the computer. 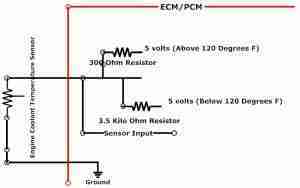 Test for less than 2 ohms in the low reference circuit end to end, review wiring diagram. If 2 ohms or more, repair the open/high resistance in the circuit. If less than 2 ohms, the computer could be defective, so consult with a professional before replacement. If less than 5 ohms with the ignition ON. Verify the scan tool ECT Sensor parameter is colder than −38°F (−39°C). If warmer than −38°F (−39°C) with ignition OFF, disconnect the harness connector at the computer. Test for infinite resistance between the signal circuit terminal and ground. If less than infinite resistance, repair the short to ground on the circuit. If infinite resistance, the computer could be defective, so consult with a professional before replacement. Engine coolant that is leaking through the sensor will create a high resistance short to ground. This condition results in less voltage on the ECT sensor signal circuit, which is interpreted by the computer as a warmer ECT. IAT (Intake Air Temperature) sensor that is skewed colder at various ambient temperatures due to greater resistance than is normal will increase the range between these two sensors. Measure and record the resistance of the IAT sensor at various ambient temperatures, then compare those measurements to the Temperature Versus Resistance – Engine Coolant Temperature Sensor table. 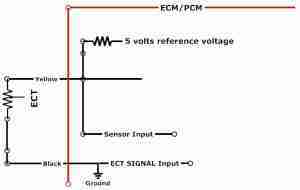 A slight to moderate resistance in the IAT sensor signal circuit or low reference circuit will increase the range between these two sensors. This condition results in a greater voltage on the IAT sensor signal circuit, which is interpreted by the computer as a colder IAT. DTC P0116 diagnostic will not execute unless: there are no IAT (Intake Air Temperature) DTCs (P0112 or P0113) sensor faults, there are no engine coolant sensor high or low input faults (P0117 or P0118), the ignition off timer has not failed (DTC P1683), and the startup IAT is greater than a calibrated value. 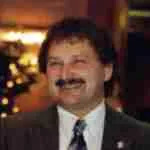 This last condition is intended to prevent false failure (Type I error) of this diagnostic due to engine block heaters. An IAT sensor (P0112 or P0113) that is skewed colder at various ambient temperatures due to greater resistance than is normal will increase the range between these two sensors. A slight to moderate resistance in the IAT (P0112 or P0113) sensor signal circuit or low reference circuit will increase the range between these two sensors. This condition results in a greater voltage on the IAT sensor (P0112 or P0113) signal circuit, which is interpreted by the computer as a colder IAT.